The year was 1892. Workers were transforming Chicago to get ready for the World’s Fair to be held in the city, otherwise known as the Chicago World’s Columbian Exposition of 1893. The fair was a huge deal. Visitors were expected from all over America and from around the world. It was named in honor of the 400 year anniversary of Columbus’s discovery of the New World in 1492. More than 150,000 people passed through the fair every day for six months making it the largest fair ever held in America up until that time and likely one of the largest fairs the world had ever seen. It was a huge undertaking, akin to getting ready for the Olympics today. 600 acres of Chicago were transformed with inspiring architecture. It took a small army working on the complex project. In time it would be called the fair that changed America and indeed in a lot of ways it did just that. A “new” building material was introduced. It was a revelation for Americans though it had been known in Europe for many years. The material was called “Staff” and it was a mixture of hemp, cement and plaster of Paris. It was used for sculptures, murals and bas-relief decorations and could be molded and worked into all sorts of artistic expressions. Most of the buildings built for the World’s Fair were not intended to be permanent structures. The hemp staff was made into slabs and nailed to wooden walls of the buildings. Several buildings do remain however to this day. The works for the ambitious outdoor sculptural program were executed in the impermanent medium of staff, a mixture of plaster of Paris and fibrous materials such as hemp fiber and straw. 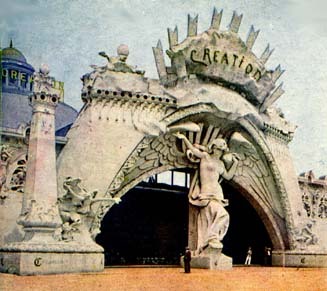 Buildings were decorated with sculptures—for instance, for the massive Administration Building, Karl Bitter created twenty-eight allegorical groups on the growth of civilization. Monumental animal sculptures—such as bison, elk, moose, and panthers—by Edward Kemeys and Alexander Phimister Proctor decorated the bridges over the fairground’s lagoon and canals. Proctor also completed outdoor equestrian sculptures of an American Indian and a cowboy, subjects readily recognizable as American icons. In fact, the exposition was a highly visible stage for American western sculpture, its subjects resonant within the fair’s larger agenda suggesting national unity from east to west. The use of hemp staff as a building material and material for sculpture is interesting. This article is meant only as an introduction to the subject. I am not aware if this subject has been explored much. It would be interesting to know if hemp staff continued in use after the fair of 1893. My guess is that it was used but further research will illuminate the subject. For now I offer this as a humble beginning of our knowledge of hemp staff. I invite other researchers to explore in greater detail. I hope this short introduction to hemp staff gives our community something to think about and hope that more information comes to light regarding the use of this remarkable substance.